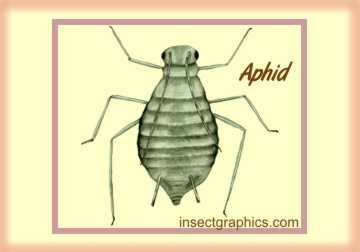 Aphids are one of the most common insects in the garden. There are many species (about 4000) and many colors of these small, soft-bodied insects. All have an interesting pair of tubular structures on their abdomen called �cornicles.� Most are wingless, but there are also winged forms, especially late in the summer. The ones with wings cannot fly well, but are so small and light that they can travel long distances on the wind. Some species feed on only one or two plants, others feed on many. They tend to cluster in large numbers on succulent new growth. They puncture the plant with their piercing-sucking mouth parts to feed on its sap. Excess is excreted as �honeydew.� This is a delicacy for ants, which may actually �ranch� the aphids, protecting them from predators and moving them here and there. You may have noticed that the queen of the ant colony in the movie A Bug's Life carried an aphid pet tucked under her arm. Aphid life cycles are varied and complex. In the spring, wingless female aphids emerge from overwintering eggs and begin giving birth to identical, live daughters, without the help of any male aphids. This is called parthenogenesis. When conditions are favourable, these wingless aphids can produce up to 5 offspring a day for up to 30 days, which will become reproducing adults themselves in about a week. Ova within these females start to develop immediately after ovulation, long before birth. This means that an embryo can exist inside another larger and more mature embryo. In fact, a newly born summer aphid can contain within herself not only the developing embryos of her daughters but also those of her grand-daughters which are developing within her daughters. Parthenogenesis combined with this 'telescoping of generations' give aphids an exceedingly rapid turn-over of generations, meaning they can build up immense populations very quickly. Since they are wingless, they cluster around the original mother, even after her death. The French naturalist Reaumur estimated that the descendants of a single aphid arranged four abreast would stretch for 27,950 miles, assuming they all survived! When conditions change (hotter weather or death of the host plant, for instance), winged forms may be produced, which will fly to a new host. As the days shorten in the fall, a sexual generation which includes males is produced, which mates and lays eggs. In the spring these will hatch, and begin all over again.